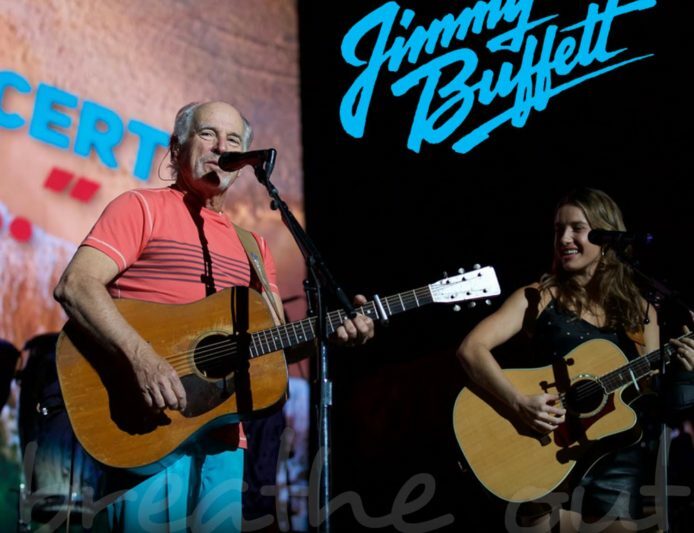 Jimmy Buffett’s duet of “Breathe In, Breathe Out, Move On” with indie singer/songwriter Caroline Jones is now available on iTunes, with proceeds benefiting Singing for Change and the non-profit’s ongoing hurricane relief efforts. YAHOO! Entertainment premiered the live performance – watch it here! Recently ranked #2 on Billboard’s “15 Country Artists to Watch in 2018”, Caroline Jones is a singer, songwriter and multi-instrumentalist who is praised for single-handedly performing the guitar, banjo, harmonica, keys, and lap steel on her forthcoming album Bare Feet (2018). Throughout 2017, Caroline supported and shared the stage with Zac Brown Band on their Welcome Home Tour, performed alongside Jimmy Buffett, Kenny Chesney, and Toby Keith at the Trying to Reason… Hurricane Relief Concert, played Driftwood Festival, and more. Previously, the spirited vocalist toured hundreds of schools & universities nationwide – including underserved and charter schools with Stedman Graham – on The Heart is Smart School Tour, inspiring 150,000+ students with her performances and workshops to date. Labor Day Weekend Set: Tune In Daily!